What does Get Closer mean? You tell us! Not in Indonesia to feel the energy of the Asian Games? Here is where we offer a chance to creatively express the passion and values of sports, community involvement and excitement by coming together and getting closer. From photos of people cheering for their teams, to local communities doing sports, Canon encourages people to celebrate diverse renditions of Energy of Asia across the continent. Get your game face on, grab your camera and get ready for action! 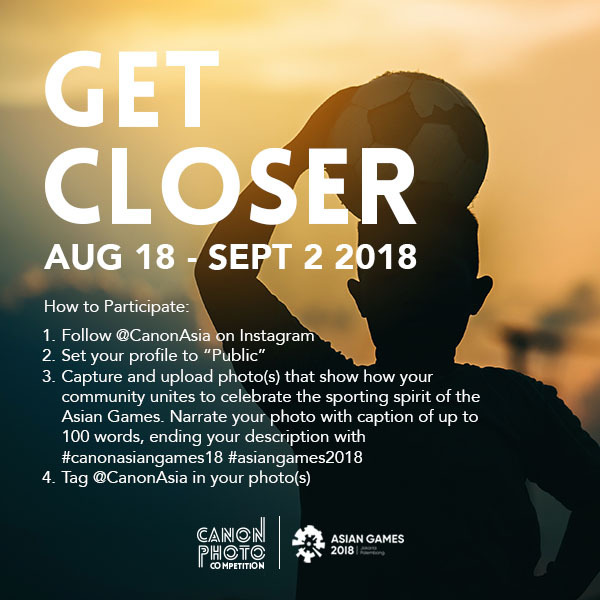 Take us closer to how your community celebrates the Asian Games through your lens and stand a chance to win our grand prizes! How to participate? 1. Follow @CanonAsia on Instagram. 2. Set your profile to “Public”. 3. Capture and upload photo(s) that show how your community unites to celebrate the sporting spirit of the Asian Games. Narrate your photo with caption of up to 100 words, ending your description with #canonasiangames18 #asiangames2018. Give your best shot and share the news! 1. The Canon Asian Games photography contest (“Contest”) is organized by Canon Singapore Pte. Ltd. (“CSPL”) and is open to all Eligible Participant(s). By submitting an entry to the Contest, you are deemed to have agreed to be bound by these Terms and Conditions. 2. Eligible Participants refer to participants who are citizens and/or legal residents of Singapore, Malaysia, Indonesia, Thailand, Vietnam, India, Hong Kong, Korea, Macau, Taiwan, Korea, the Philippines, Myanmar, Cambodia, Brunei, Nepal, Sri Lanka, Maldives, Bangladesh, Pakistan, Mongolia and East Timor and exclude employees of CSPL and its affiliate companies and partners and vendors involved in the Contest. 3. The ‘Contest Period’ is from 18 August 2018 to 2 September 2018.
c) Upload their choice of photo(s) on Instagram which best reflects the Contest theme, with a caption up to 100 words to narrate their story. 5. Multiple entries may be submitted. 6. Photos can be taken on any camera. Any editing is limited to only brightness, contrast, saturation/color, sharpening, and cropping. Collage, latching, photomontage, removing object, or anything outside the allowed editing is NOT accepted. This is not a Photoshop/editing competition, hence the submitted photos should represent the core theme of the competition. (c) must contain original works and not contain material that violates or infringes on another’s rights, including publicity and intellectual property rights. 8. At the end of the Contest Period, winners (“Winners”) will be selected at the sole and absolute discretion of CSPL. 9. Winners will be contacted via their Instagram account and further information of the Winners may need to be submitted to arrange the delivery of the prize to the Winners. Winners will be required to respond within 7 days from the receipt of notification from CSPL failing which CSPL will have the right to select another winner or forfeit the prize. 10. Prizes are non-transferable and non-exchangeable and subject to any accompanying terms and conditions accompanying them. CSPL, may, at its sole and absolute discretion, withdraw and/or substitute any prize with any other item of similar value without notice and/or furnishing any reason. 11. Winners shall be solely responsible for any taxes, fee and costs that may be incurred in connection with their participation in the Contest and/or receipt of the Prize. 12. Prizes are awarded on an “as is” basis, without warranty or accessories of any kind from CSPL. 13. Winner(s) are required to claim their Prize at such location as may be notified by CSPL or may be delivered to the Winner/s at CSPL’s sole and absolute discretion. Winners will be required to show his/her original identification card or passport for verification of identity and eligibility. CSPL will not be held liable for a prize if it does not reach the Winner/s for reasons beyond its control. 14. Each Eligible Participant represents and warrants all submissions and information (“Material”) submitted by him/her are true and accurate, that he/she is the owner of all intellectual property rights in the Materials; that the Materials do not infringe any copyright, trademark, intellectual property rights, moral rights, rights of privacy or publicity of any person, or any other right of any third party and that he/she has the full and unrestricted right to transfer the said materials to CSPL free and clear of any claims or encumbrances for its collection, use and disclosure in accordance with these terms and conditions and has obtained the contest of third parties where required. 16. Each Eligible Participant grants an unrestricted, royalty free, irrevocable, perpetual and fully sub-licensable license to CSPL to copy, reproduce, use, display, modify, transmit, distribute and create derivative works of the entries (along with a name credit) relating to or in connection with the Purposes, in any media now or hereafter known including but not limited to websites, social media, at CSPL’s sole and absolute discretion and waives all claims for compensation or further approval in this respect. 17. The Winner/s may, at no cost to CSPL, be requested to participate in public relations events tied to the Contest and/or any related advertising or other campaign to generate press coverage of the Contest and/or any such campaign. This may include, but not be limited to, quotes given for inclusion in press releases and press conferences, interviews. 18. CSPL may disqualify any entry and/or forfeit the Prize of any Participant that breaches any of these Terms and Conditions. 19. CSPL shall have the sole and absolute discretion to decide on all matters relating to or in connection with the Contest (including but not limited to eligibility and the conduct of the Contest, the winning entry and the Winner/s) and such decision(s) shall be final and binding on all participants. CSPL shall not be obliged to enter into any correspondence on any matter concerning the Contest. 20. CSPL may at any time at its sole and absolute discretion terminate the Contest or vary any of these Terms and Conditions without prior notice and without furnishing any reason. 21. Each participant agrees not to hold CSPL and its affiliated companies and partners for any claims, losses, liabilities, expenses, costs and damages arising from and in connection with this Contest. 22. In the event of any inconsistency between the Terms and Conditions and any advertising, promotional, publicity and other material relating to or in connection with the Contest, these Terms and Conditions shall prevail. 23. These Terms and Conditions shall be governed by Singapore laws and the participants of the Contest shall submit to the exclusive jurisdiction of Singapore courts. Availability of the Contest in any country is subject to such Contest not being unlawful or restricted under the laws of such country. Eligible Participant’s ability to enter the Contest does not constitute any offer by CSPL to a party in a jurisdiction where the availability of the Contest is unlawful or restricted.